High Tech Polishing started out in 1985 providing mold polishing for the plastics industry.  In 1992, a division called High Tech Laser was formed as a laser engraving job shop for the plastics industry as well. Today, High Tech Laser and Polishing continues to serve various companies throughout the United States, Canada, Mexico, and Puerto Rico. With both YAG and CO2 laser systems, High Tech Laser has the capability to engrave on or cut out virtually any material in the business. Here at High Tech, we consider ourselves pioneers of mold surface laser engraving and true 3D laser engraving. We offer a wide range of highly detailed engraving, cutting and texturing capabilities. Additionally, High Tech can handle and provide turn-key projects with our aligned service type providers in the powder coating, anodizing, plating and manufacturing sectors. From 1-piece specialized custom work to high volume production projects, we have the equipment, people and processes to fit your needs.